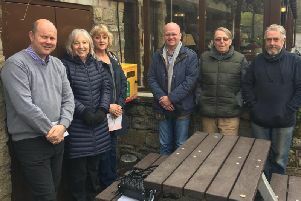 Three citizenship awards will be made by Todmorden Town Council at its annual meeting - and the town can pat itself on the back for one of them. Councillors recently approved two awardees who have served the the town well - and agreed a one-off award should be made covering the whole town for pulling together in the aftermath of the Boxing Day flooding. “The People of Todmorden” were nominated to receive a one-off Special Award for 2016 to recognise the enormous efforts and contributions made by the many groups and individuals during that period and afterwards. The two individual Citizenship for Todmorden Awards will be made to Shirley Fielder and Janet Garner. Shirley was nominated for the 40 years of voluntary service that she has given the town in a number of different areas of town life. She started as a Girl Guide who helped raise funds for a canal boat purchase, and has long been a supporter of the movement including associated events such as Todmorden Gang Show. Shirley is a founder member of Upper Calder Charities Assist, and is a former president of Todmorden Agricultural Society. More recently she has become a director of the Todmorden Community Resource Centre. Janet co-founded Todmorden Food Drop In (TFDI), based at St Mary’s Church in Todmorden town centre, in 2013 and has since organised and run the centre, which provides food for 80 to 100 households per week. Janet’s drive and organisational skills have made TFDI by far the largest voluntary organisation in the upper Calder Valley, says the council. “With some 80 volunteers to organise, her enthusiasm and people skills have kept the volunteers happy and focused, making the centre a place which both users and volunteers are part of,” the council says. She is also a member of the Parochial Church Council, has run the Bereavement Counselling Service, and provided the professional training enabling St Mary’s to set up its Counselling Service. Despite living in Bacup, Janet spends most of her time in Todmorden contributing to the betterment of the lives of the poor, unemployed, troubled and vulnerable people of all ages in Todmorden, says the council. The awards are traditionally made by the retiring Mayor on Mayor’s Day in May and the public are invited each year to make nimonations, which then have to be approved by councillors.